The Islamic Educational, Scientific and Cultural Organization (ISESCO) has denounced the chemical attack carried by the Syrian regime forces against civilians in the city of Douma (East of Damascus), killing dozens of children, women and men. The Rabat-based Islamic organization described the Syrian regime’s assault as “a war crime and a crime against humanity” and called for protecting the Syrian people from the continuous atrocious crimes. US President Donald Trump said there would be a “big price to pay” for what he said was a chemical attack in Douma. In April last year, the US fired cruise missiles at a Syrian airbase after a Sarin attack on the opposition-held town of Khan Sheikhoun killed more than 80 people. US Defense Secretary Jim Mattis refused to rule out a military response to the latest incident. 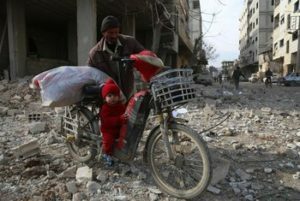 Washington and Paris threatened a “joint response”, while UK Prime Minister Theresa May hit out at the Syrian government’s Russian backers, saying they also needed to be held to account for the “brutal actions” of the Assad regime. London condemned the “barbaric” chemical weapons attack in Syria, saying it is another example of the Assad regime’s brutality. But Russia has said there is no evidence of a chemical weapons attack in formerly rebel-held Douma. The Organisation for the Prohibition of Chemical Weapons expressed “grave concern” about the alleged attack and opened an investigation. UN Secretary-General called on all parties to cease fighting and restore the calm that had been in place and adhere fully to Security Council resolution 2401, adopted in February and which called for a ceasefire across Syria. “Any use of chemical weapons, if confirmed, is abhorrent, and requires a thorough investigation”, stressed the UN Chief. Since 11 March, some 25,000 people have reportedly left East Ghouta, seeking shelter in the rural Damascus villages of Dweir, Adra and Herjelleh. Written by: Jaber Ali on April 9, 2018.on April 10, 2018. Posted by Jaber Ali on Apr 9 2018. Filed under Headlines, World News. You can follow any responses to this entry through the RSS 2.0. Both comments and pings are currently closed.